Echo Ultrasonics has recently become the exclusive distributor of SpectrumGlide AUT-NDT Fluid Couplant in the U.S. and Canada. SpectrumGlide, developed by Eclipse Scientific, has a viscosity formulated to reduce runoff and provide longer dwell time at temperatures from -50° F to 730° F (-45° C to 387° C). 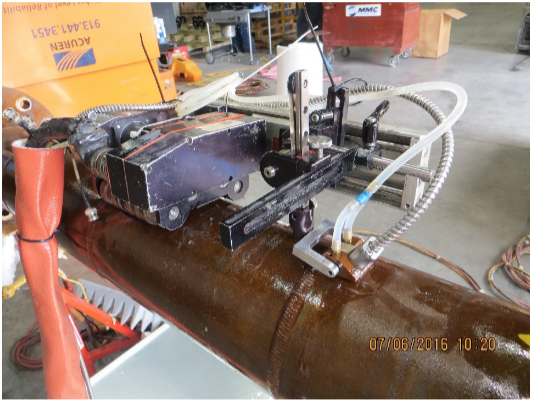 The addition of SpectrumGlide gives Echo Ultrasonics a full range of automated ultrasonic testing fluids, with viscosities ranging from 125 to 5000 cps and covering temperatures from -70° F to 1200° F (-57° C to 649° C). SpectrumGlide’s formulation results in faster and more efficient testing by allowing it to remain on pipes, tanks and other surfaces longer without draining off. Because it can be used in testing environments up to 780°F (415°C), it’s a versatile fluid for high-temperature AUT applications. Echo has a complete line of automated ultrasonic testing fluids offering solutions for those who’ve encountered problems with other fluids. Often, fluids are thick and difficult to pump, run off quickly, smoke excessively, auto-ignite, freeze or vaporize so rapidly that there’s no time to conduct the inspection. With AUT fluids in multiple viscosities (thicknesses) spanning a broad range of temperatures, Echo has solutions to each of these problems. Several Echo AUT fluids are water-soluble, so they don’t leave a film on water when used at sea. Echo AUT fluids have viscosities ranging from 125 to 5000 cps and covering temperatures from -70° F to 1250° F (-57° C to 675° C). To learn more about SpectrumGlide, or to evaluate any of our fluids, contact us for complementary samples: www.echoultrasonics.com or 360-671-9121. Echo Ultrasonics specializes in the development and manufacturing of ultrasonic couplants and fluids. 50 years of developing and manufacturing the world’s leading NDT ultrasonic couplants enable Echo Ultrasonics to provide customers with the most cost-effective, highest-performance and safest couplants for each application. Let us recommend and provide samples of the right couplant with today’s technology for your specific needs.